Open album – Opens the Open photo album screen. Use it to open, delete or rename an album order. Delete Album – Opens the Delete album screen. Close – Closes the current album and clears the working area. Save – Saves the current album. The album is automatically saved during the editing session so there is no need to perform this operation manually. Create another copy – creates and open a new photo album order based on the current order. 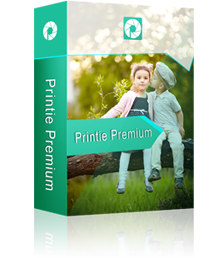 Exit –Exits the Printie Premium application. Undo – Undo the last operation. Only one undo operation is available by the Album maker application. Copy – Copy the selected item (picture, text box, etc.). Paste – Creates a new item (picture, text, etc) based on the last copied item. Delete - Delete the selected item. Asks for user acknowledge. Copy background – Copies the background of the current page. Paste background – Paste the last copied background to the current page. Paste special – Pastes the last copied item's design (frame, mask or effect) to the selected item. Paste special on all the pages – Pastes the last copied design on all the items in the album pages. Select all – selects all the items in the page. Show album preview –Shows the final album pages in a full screen mode. The user can flip through the pages. Show report – Show an HTML page which includes the thumbnails of the pages and the order information. Layout – selects the Page layout view in the Toolbox. Cliparts – selects the Cliparts view in the Toolbox. Frames – selects the Frames view in the Toolbox. Masks – selects the Masks view in the Toolbox. Effects – selects the Effects view in the Toolbox. Backgrounds – selects the Backgrounds view in the Toolbox. Zoom – Enable selection of page zooming on the working space. Show element list – Selecting this optioninitiate a table as the one below. Grid – Selecting this option presenting another sub menu with three options. 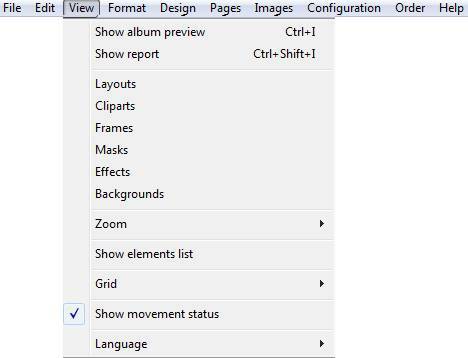 Show movement status – If this option is marked then once you move any object located on a page (like: text box, place holder, clipart …) a yellow box as bellows appears. There are always 5 values as the following: Left, Top, Width, Height and rotate. If the option is unchecked then box will not appear. Language – here you can change the language interface according the available languages. Original image – Undo crop on the selected image. Crop image – Open the crop tool on the selected image. Show full image in frame - Fit the selected whole image in its place holder while keeping the original image proportions. Crop image to frame – Fill the selected image into its place holder (change the image proportions to the place holder proportions). 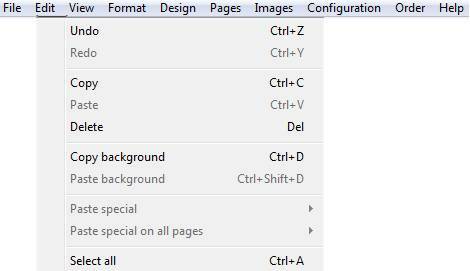 Set as page background – set the selected image as background for the current page. Align – Align the selected elements according to the first selected element location (left, top, etc.). Make same size – Make the size (width, height, both) of the selected elements equal according to the first selected element. Center in page – Center the selected element(s) in the page. Spacing – Set equal spacing (or no spacing) between the selected elements. Order – Change the order of the selected element in the page relative to the other elements in page. Rotate – Select rotation option (right / left) for the selected elements. Flip – Flip the selected images horizontally or vertically. Frames – Enables to apply the selected frame on the selected image(s), or to remove the frame(s) from the selected image(s). Masks – Enables to apply the selected mask on the selected images, or to remove the mask(s) from the selected image(s). Effects – Enables to apply the selected effect on the selected images, or to remove the effect(s) from the selected image(s), or to apply/'clear opacity for the selected image(s). Backgrounds – Set background color in current page, set opacity on the current page background, or clear the background from current page. Texts – add text element to the current page or edit the selected text element. Cliparts – add clipart element from a file. 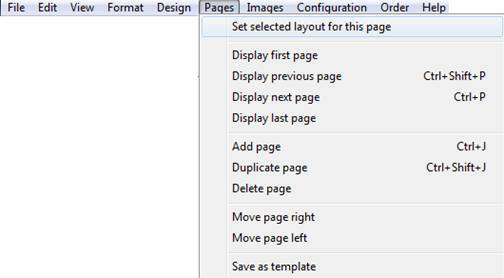 Set selected layout for this page – change the page layout to the selected layout in the Page/cover Layout toolbox. Display first page – Display the first page on the working space. Display previous page – Display the previous page on the working space. Display next page – Display the next page on the working space. Display last page – Display the last page on the working space. Add page – Opens a dialog to select a layout for a new page to be added to the album after the current page. Duplicate page – Duplicate the current page of the album. Delete page – Delete the current page of the album. Move page right – move the current page of the album to the right. Move page left – move the current page of the album to the left. Save as template- selecting this option will add the current page to the available templates. The following message will appear : ‘the new template has been added successfully’, and then you will be able to see the new template under page/cover layout. Add image place holder to the page – adds a new empty place holder to current page. Add – Opens the 'select pictures' screen and select new images to add to the pictures list. Remove selected images – remove the selected images from the album and from the pictures list. Remove all images – remove all the images from the album and from the pictures list. Fix red eye – Initiate the red eye removal window. Color correction – Initiate the color correction window. Rotate right – rotate the selected images in the pictures list to the right. Rotate left – rotate the selected images in the pictures list to the left. Manually update files – select a configuration (ZIP) file that contains new price and content definitions (products, frames, masks, effects, clip-arts and backgrounds) and update the system accordingly. Check web for latest files – Check the print-shop web site for price and content updates and update the system accordingly. Order Album – Starts the ordering wizard for the current album. Start FTP uploader – Initiates the ‘Album FTP uploader’ . Backup order – backups the order in OBF format. Restore Order – restores the order. Show help – opens the current help file.